As a rookie, I’m discovering what others have probably known for a long time. You write and rack your brain for new material. You respond to comments. You visit other sites and connect with other bloggers who may be in the same boat you’re in, looking for exposure. I’m a big Doonesbury fan. Do you know the Rick Redfern character? He’s the middle aged, bearded character with tieaskew who was a former Washington Post reporter. Now unemployed, a casualty of the decline in the newspaper business, he blogs for the Huffington Post, unpaid of course. Yet he hopes this investment of his time and skills will get him back in the game. I totally relate to Rick. Meanwhile his idiot son Jeff who lives in the basement has stumbled into fame and wealth with a book he wrote about a cartoonish warrior. It was too easy. This is a long and rambling introduction to acknowledge all the bloggers out there who toil away at their laptops for a cause, a teaching moment, an opportunity to be heard and build a following, to share something with others, but generally not to make money. I suggest you visit her site and check out her book. I’ll be back with more personal insights next week. So please subscribe and follow me. If there’s anything you want me to write about please write a comment. I respond! 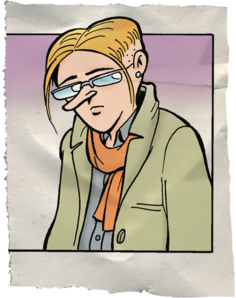 This entry was posted in Uncategorized and tagged adoption, Adoptive Parent, Doonesbury, Huffington Post. Bookmark the permalink.